It is likely that you already own a recording of a performance by Julius Baker. 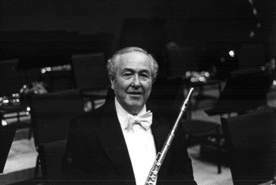 In addition to his many solo LPs, Baker played principal flute on the famed Columbia Broadcasting Symphony (CBS) Orchestra recordings conducted by Bruno Walter and on the New York Philharmonic discs of 1965-83, under the baton of Leonard Bernstein. Vintage records of the Chicago Symphony and the Bach Aria Group, as well as the movie soundtracks to Fame, Lovesick, Beauty & the Beast and the Bernstein-Carreras-Te Kanawa collaboration of West Side Story, all include flute performances by Julius Baker. He has served as solo flutist in America's leading orchestras and, as professor of flute at The Curtis Institute of Music and The Juilliard School. 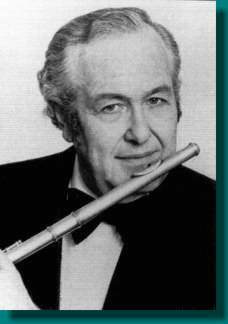 Mr. Baker has trained the flutists who will continue to dominate the musical scene for decades to come. His former students perform in the world's greatest orchestras and as solo recitalists. Included are such luminaries as Paula Robison, Jeanne Baxstresser, Jeffrey Khaner, Eugenia Zuckerman, Joshua Smith and Gary Schocker.